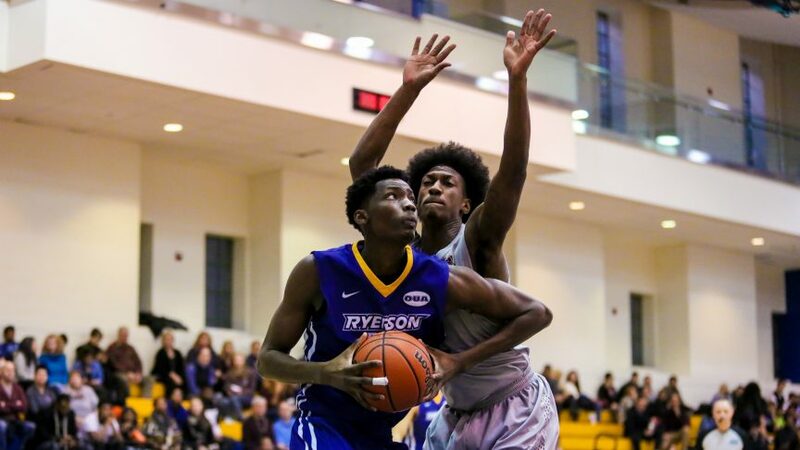 A double-double performance from sophomore centre Tanor Ngom led the No.1 ranked Ryerson Rams men’s basketball team to a 88-69 win over the Toronto Varsity Blues at the Goldring Centre on Feb. 1. Ngom dropped 21 points and 11 rebounds, while making his presence known in the paint with five blocks on 8-12 shooting. It was a night where the seven-foot-two inch big man hit his first career three pointer, something that his teammates got excited about. Ryerson wouldn’t let Toronto get within single-digits after the first quarter, winning by 19 on the road and improving their record to 18-1 on the year. This is the Rams’ 13th straight win against the Varsity Blues, as they swept the season series for the sixth straight year. Third-year forward Keevon Small got the start for the first time this season, due to Filip Vujadinovic being sidelined with an injury. Small didn’t look out of place, adding eight points and four rebounds on 3-3 shooting in the first half alone. Assistant coach Borko Popic said Vujadinovic’s injury isn’t long term, as well as second-year forward Liam O’Leary, who had a cast around his foot. Both are expected to be available next week. Small is starting to find his stroke from long distance, connecting from deep at least once in the Rams’ last five games. The Rams would close the first half with point guard Myles Charvis hitting a full court shot to beat the buzzer, giving Ryerson a 53-29 advantage. Charvis finished with 16 points and five assists in 32 minutes of action. Off the bench, Jayden Frederick and Warsame Mohamed combined for 22 points on 10-15 shooting. Ryerson also had a season-low five turnovers in this contest. Leading by as many as 24, the Varsity Blues would outscore the Rams 22-12 in the third frame and cut their deficit to 13, thanks in large part to guard Evan Shadkami. Shadkami connected on three triples in the second half and gave Toronto some hope, pouring in 22 points on 6-14 shooting. Unfortunately, his efforts wouldn’t be enough to put his team over the hump. The Rams picked up their eighth straight win, and Toronto has now lost four games in a row. With the post-season approaching later this month, the team is focused on ending their last four regular season games on a high note. On a side note, as reported first by Elias Sbiet of North Pole Hoops, the Rams had a top point guard in Adefolarin Adetogun in attendance for Friday’s matchup. In what seemed to be a recruiting visit, Popic wouldn’t comment on it. Adetogun is expected to choose between either the Rams or Carleton Ravens, according to his scouting page on the North Pole Hoops website. UP NEXT: The Rams will take on the Nipissing Lakers at the Robert J. Surtees Student Athletic Centre on Feb. 8. Tip-off is scheduled for 8 p.m.